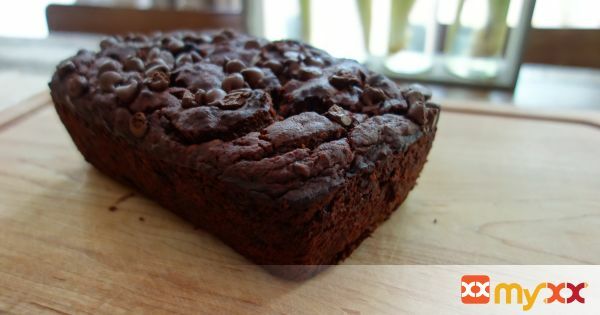 Who knew that decadent chocolate banana bread could actually be good for you? 1. Preheat the oven to 375 degrees F. Spray a 9- by 5-inch loaf pan with cooking spray. 2. In a stand mixer, using a paddle attachment, mix avocado, bananas, egg, agave nectar and vanilla until smooth. 3. In a separate bowl, whisk together flour, cacao powder, baking soda, cinnamon, salt and allspice. 4. Fold the flour mixture and 1/2 cup of the chocolate chips into the avocado mixture until just combined. 5. Pour batter into loaf pan and sprinkle remaining chocolate chips. 6. Bake until a toothpick inserted in the center comes out clean, about 1 hour 15 minutes. 7. Let cool completely before removing from pan.